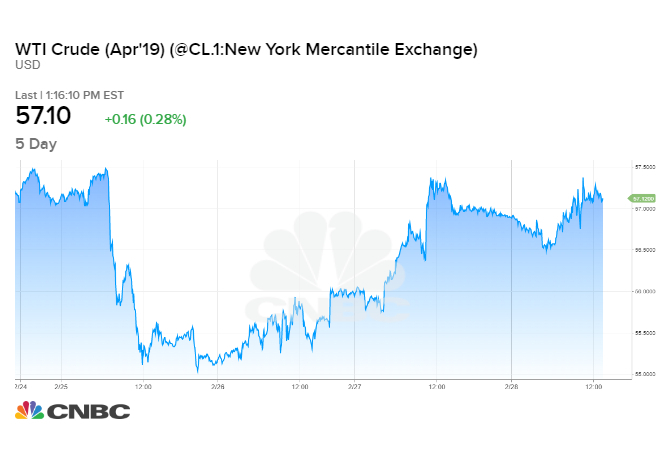 Oil prices were mixed on Thursday, following a volatile trading period that saw crude futures plunge more than 3 percent at the start of the week and rally more than 2 percent in the previous session. Crude futures recovered on Wednesday after Saudi Arabia’s influential oil minister brushed off pressure from President Donald Trump to “take it easy” on price-boosting production cuts. Trump’s warning to Saudi Arabia and its fellow OPEC members was the catalyst for oil’s decline earlier in the week. An unexpected plunge in U.S. crude stockpiles added fuel to Wednesday’s rally. U.S. West Texas Intermediate crude was up 12 cents, or nearly half a percent, at $57.06 around 2:25 p.m. ET. On Wednesday, WTI rebounded back towards last week’s three-month peak, but fell short of setting a new 2019 high. Brent crude was down 40 cents, or half a percent, at $65.99 per barrel. 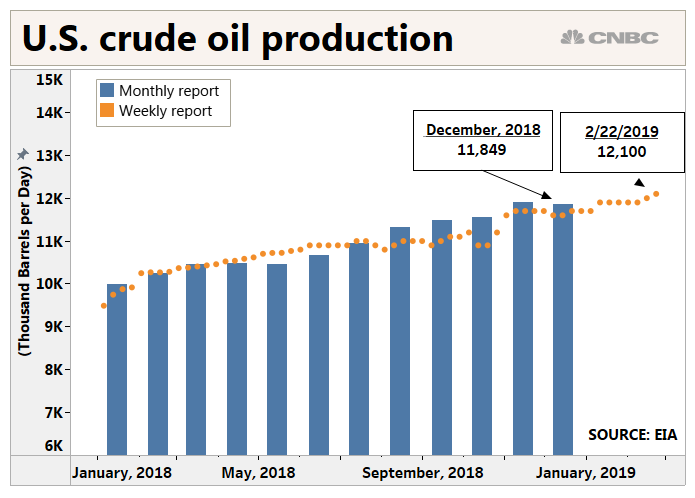 Also weighing on oil prices, U.S. crude production rose more than 2 million barrels per day in the last year to a record 12.1 million bpd, according to preliminary weekly figures released by the Energy Information Administration on Wednesday. EIA’s first monthly reading on U.S. production for December showed a slight drop from the previous month to about 11.85 million bpd. The production figures were offset by a surprise 8.6-million-barrels drop in the nation’s stockpiles of crude oil, despite inventories at the closely watched storage hub at Cushing, Oklahoma rising by 1.7 million barrels. The U.S. Energy Department on Thursday announced it will withdraw 6 million barrels from the nation’s Strategic Petroleum Reserve and sell them into the market for delivery between April and May. Over a 60-day delivery period, that pencils out to about 100,000 bpd of extra supply in a market that is expected to consume 100 million bpd this year. “It doesn’t seem like very much to me in the scheme as things,” said Andrew Lipow, president of Lipow Oil Associates. Supply cuts by OPEC and its allies, such as Russia, a group known as OPEC+, have offered support since January. That reduction helped drive down U.S. commercial crude inventories last week. Despite Trump resuming his pressure campaign on OPEC and Congress advancing legislation to hobble the producer group, OPEC Secretary General Mohammed Barkindo on Thursday highlighted the interdependence of OPEC producers and U.S. drillers. “The decisions that OPEC took, together with our non-OPEC partners, literally rescued this industry from total collapse,” Barkindo told CNBC in Riyadh on Wednesday. “Without this shale revolution we’ve seen in the U.S. the world would have been in major, major energy chaos,” he said. – CNBC’s Holly Ellyatt and Reuters contributed to this report.